As the Whorl Spins: Innovative New Tool! Do you face challenges when plying? Are you tired of your traditional Lazy Kate? Then why not try the all new Lazy Cat*? The innovative new plying tool that is guaranteed to make plying nearly impossible and add 3% cat fibre content to every yarn you make? 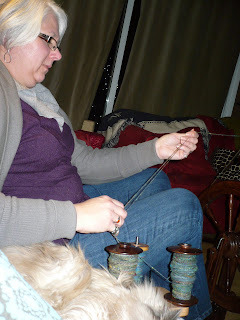 Not only will the Lazy Cat* slow those bobbins right down and keep your yarn from inconveniently becoming plied, it is a fabulous way to remove the smile from any spinner's face. And when you are fed up with your Lazy Cat*, it can be removed with only minimal hissing and scratching. There's a problem with my Lazy Cat* . . . 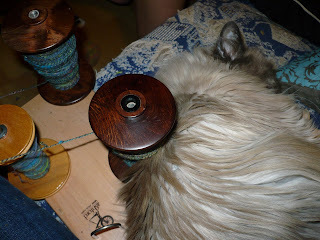 Instead of simple friction, my bobbins all-out stop due to sharp little kitten claws. Maybe it will get better over time?